Earlier today I sold my shares of Graham (GHM) on a plunge in the stock price below my purchase price on what appeared to be a reasonably good earnings report. I suppose with the rise in the price of oil and this earnings report, the stock reacted to the news. It doesn't matter to me. My sale is based on the price performance of my holding and not my own expectations of the future prospects. Dipping below my minimum of 5 positions generated a 'buy signal' for me to replace it with a position of reduced size (1/2 of the average size of the remaining positions.) I have initiated purchases based on sales on good news to be sized at the average of the remaining holdings. Looking through the lists of top % gainers on the NASDAQ today, I came across Expeditors (EXPD) and felt it would fit well into my own portfolio. Let me share with you briefly why I made this decision and decided to purchase 45 shares of EXPD at $40.19. As I write, EXPD is trading at $38.68, a bit below my own purchase, trading up $6.68 or 20.88% on the day. First of all, what drove the stock higher today was the announcement of 3rd quarter 2008 results. Earnings came in at $85.6 million during the 3rd quarter, up from $74.3 million during the same period last year. Diluted earnings per share worked out to $.39/share this year, up from $.34/share last year. The company reported "same-store" results, with same store net revenue climbing 11%, and same store operating income climbing 13% year-over-year. Revenue for the quarter came in at $1.56 billion, up from $1.41 billion last year. The company exceeded expectations on earnings and apparently met expectations on revenue results. Analysts had been looking for $.37/share (the company beat this by $.02). Longer-term, if we check the Morningstar.com "5-Yr Restated" financials on EXPD, we can see that revenue has been steadily increasing with $2.6 billion in sales in 2003, climbing to $5.2 billion in 2007 and $5.6 billion in the trailing twelve months (TTM). Earnings have also steadily increased from $.46/share in 2003 to $1.21/share in 2007 and $1.28/share in the TTM. The company pays a dividend and has been increasing the dividend annually from $.08/share in 2003 to $.30 share in the TTM. Outstanding shares have been very stable with 216 million shares in 2003, increasing only to 221 million in the TTM. Free cash flow has been positive and growing from $176 million in 2005 to $243 million in the TTM. The balance sheet appears solid with $703 million in cash and $1.04 billion in other current assets. This yields a current ratio of 2.0. The company reports only $95 million of long-term liabilities. Looking at some valuation numbers, we can see that this is a large cap stock with a market cap of $8.22 billion according to Yahoo "Key Statistics". The trailing p/e is 30.27 with a forward p/e (fye 31-Dec-09) of 25.43. The PEG (5 yr expected) works out to an acceptable 1.51. Yahoo reports 213 million shares outstanding with 209 million that float. 9.18 million shares are out short representing a short ratio of 2.2 days. The company, as noted, pays a dividend with a forward yield of 1.0%. The last stock split was a 2:1 split back on June 26, 2006. 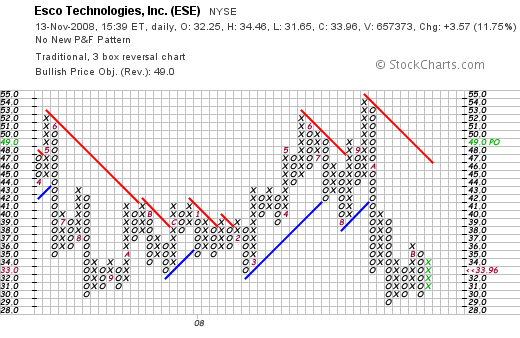 If we examine a 'point & figure' chart on EXPD from StockCharts.com, we can see that the stock has been relatively weak since peaking at $54 in August, 2007, and has traded as low as $25 in October, 2008. The stock has recently broken through resistance at the $36 level, and short-term appears to be a bullish chart. To summarize, with my sale of Graham (GHM) putting me under 5 positions, my own strategy requires a minimum of 5 holdings in my portfolio (with my own maximum of 20 positions). I set out to find a new holding starting with the top % gainers lists. Expeditors was performing well today, and a closer look reveals a terrific earnings report, a longer-term record and financial fundamentals quite impressive, and a less than impressive chart. But it was enough to get me to bite and nibble away I went. Graham Corp (GHM) and WMS Industries (WMS) "Trading Transparency"
There is no doubt that Graham (GHM) a relatively thinly-traded AMEX stock has been one of the most volatile of my holdings. It has performed for me on the upside, and I have burned my fingers on this stock more than once. Add today to that list of burnt fingers! Graham (GHM) was purchased in my Trading Account last month, purchased 10/8/08 at a cost basis per share of $16.34. I sold my first portion of Graham at a 30% gain only 5 days later on 10/13/08 at $22.37. Today, after the 2nd quarter 2009 earnings report was released, the stock slumped, even though the rest of the market was enjoying an Election Day rally. As I write, GHM is trading at $15.43, down $(5.52) or (26.35)% on the day. I sold my 360 remaining shares of Graham (GHM) earlier this morning at $15.441. This represented a loss of $(.90) or (5.50)% from my purchase. This sale was not at a 16% loss limit as I have discussed in my previous posts that I have been implementing for my remaining 5 positions. But this represents my still employed strategy of selling stocks if they break through my purchase cost if I have sold once at a gain. And this is exacly what has happened. Going down to 4 positions, this entitled me to add a new position, and I did purchase 45 shares of Expeditors Intl (EXPD) at $40.19/share. I shall try to discuss this later today. But what I wanted to discuss further was my partial sale of WMS Industries, sold almost immediately after my Graham sale, but this time on 'good news' due to an appreciation in that stock's price! WMS Industries (WMS) is a recent purchase of mine, having acquired 96 shares at a cost basis of $20.12 on 10/28/08. This morning I sold 1/7th of my WMS holding or 13 shares at $26.67. This represented a gain of $6.55 or 32.6% since purchase. My next targeted appreciation point for a sale of 1/7th of my remaining shares would be at a 60% gain or 1.6 x $20.12 = $32.19. On the downside, just like my sale today of my Graham (GHM) shares, after a single partial sale at a 30% appreciation level, I sell my shares should they decline or pass through break-even. Thus remaining shares would be sold if WMS should decline to $20.12. These two sales demonstrate my philosophy of selling both on bad and good news. Both of these sales have triggered buys in different fashions. My Graham (GHM) sale brought me under my minimum of 5 positions and I did go ahead and purchase a small position of EXPD (1/2 of the average size of my remaining positions), and now have a 'permission slip' to be adding a 6th position which would be slightly larger, actually at the average size of my remaining holdings. Thanks so much for stopping by and visting! If you have any comments or questions, please feel free to leave them on the blog or email me at bobsadviceforstocks@lycos.com. A Reader Writes "Do I understand correctly...?" One of my favorite activities on this blog is to receive and respond to emails. I am always interested in discussing stocks and my methods with fellow investors who are also interested in understanding investment methods. But let me get right to Don's letter as he has some questions for me about my own idiosyncratic approach to buying and selling stocks and managing my portfolio in the face of a volatile market that swings from bear into bull and leaves many an investor scrambling to figure the appropriate strategy. I started a fairly ambitious project in response to your note about the changes to your system, but just plain ran out of time this weekend. I'll keep at it. I think you'll find the results interesting. And on a semi related note, I attended a seminar on Fidelity's Wealth Lab Pro system testing software, and, as a minimum it looks interesting. Once you have the rules for a system set up, you can run it on any portfolio of stocks going back 30 years. It's virtually instantaneous. "30, 60, 90, and 120% appreciation, then 180, 240, 300, 360 and 450% appreciation targets, then 540, 630, 720 and 810% appreciation levels, etc." My question is this, if you buy 700 shares, do you sell 100 at each of those levels, or, does it mean 100 (leaving 600), then 85 (1/7th of 600), then 74 (1/7 of 515), etc? Thanks, and good luck in this market! First of all I would like to thank you Don for taking the time to write! I have enjoyed reading many of your own entries and watching you gather many 'fans' of your own on your Covestor page. There is nobody on Covestor with as much enthusiasm as you have in teaching and sharing ideas with fellow investors! But let me get back to your letter. I will not spend much time talking about stock selection as you understand some of the basic premises with recent price momentum, solid recent quarterly and longer-term results, positive free cash flow, stable outstanding shares, and reasonable balance sheets as ideas that many of us share. Currently I am trying to keep my portfolio at between five and twenty positions. As you know, as my stocks appreciate to set appreciation levels (the 30%, 60%, 90%, 120%, 180, 240, 300, and 360%, and then 450, 540, 630%....etc. ), I have chosen to sell a portion of my holding. Initially selling 1/4 of my remaining shares, I have gradually reduced this amount and have now chosen to sell 1/7th of remaining shares. Thus if I had 700 shares, I would first sell 1/7th of 700 or 100 shares, then 1/7th of 600 shares or 85 shares, then 1/7th of 515 shares or 73 shares, etc. However, I have not previously detailed my amount of a new position to purchase. Mathematically, I have recently chosen to purchase a new position equal to the average size in dollars of the remaining positions. I do this as long as I have at least 5 positions in my portfolio. As you know, I have sales of positions on declines as well. Simply put, after an initial purchase, I sell my entire position at an 8% decline if I have not sold these shares previously, and I am at 6 or greater number of holdings. At 5 or less holdings, I am assuming that the bear market is severe and my tolerance has now been increased to a 16% decline. After a holding has reached the first partial sale point at a gain, I move my sale point up from an 8% loss to break-even. After more than a single sale at a gain, I have moved my sale point up to 1/2 of the highest appreciation point for a sale of the entire position. Again I emphasize that sales on the downside are entire positions rather than partial sales as I implement on the upside. As I get down to 5 positions, my sale target changes to a uniform 16% loss from the purchase price. But I believe in maintaining 5 positions as a minimum. Even if I am in a bear market and am handed losss after loss. It is my reliance on my own exposure to equities that determines my own actions and response in the market. Much like a parrot in a coal mine, these positions offer me a rational (?) approach to determining the market environment and guiding me in my own investment decisions. I hope you are following me. In addition, I have changed something else. Previously, I have been pretty 'seat of the pants' in determining the size of the positions I shall be buying. If I am buying shares in a position just to get me back to my 5 position minimum, obviously, the market environment is pretty awful (as it has been recently) and I should be working to reduce my exposure. Since I am determined to have those five positions, I should at lease reduce the size of those holdings---and this is one of the changes I have implemented--these replacement holdings are now set as 1/2 of the average size of the remaining positions. If I get up to 5 positions and I get a permission slip to be buying a new position as one of my 5 has hit a sale point on a gain----then I increase the size of the new position back to the 'average' of the remaining positions I hold. Thus, as I move back up to 20 positions, the holdings should increase, I continue to be in a relatively bullish posture until I get down to 5 positions---as I should---because between 5 and 20, I only get 'buy signals' because one of my holdings has been performing properly and has hit a sale point on an upward gain. However, at 5 or less positions, as I sell them, I am buying new positions only to get my portfolio back to 5 and thus I am paradoxically getting a buy signal after selling something at a loss. Thus, with these sales, I still replace to get back to 5, but buy a smaller position---1/2 of the average size of the remaining holdings. Don, I hope this answers your basic question. I know that my entire process seems far more complicated than necessary. However, I believe it is a logical process and look forward to hearing more of your thoughts on this and whether you think it might in fact work! If you have any other questions or comments, please feel free to leave them on the blog or email me at bobsadviceforstocks@lycos.com. I start out each entry or almost every entry with that comment because I mean it. I also mean it when I say I am an amateur. So always keep that in mind. You may have reached this website because you searched "stock pick" on Google. Or maybe you were looking for "stock advice" or maybe you have been here before and understand what I am doing as I write my stock selections and share with you my actual trades and results. For picking stocks may well be the easiest part of the entire equation. There are many ways to evaluate stocks, for the most part I am a momentum investor. I select stocks with daily momentum of price, recent momentum of earnings, longer-term momentum of improving fundamentals, with reasonable financials, desirable valuation, and an acceptable chart. I don't always get all of those criteria met, but those are the bulk of the things I consider. I am not much different from many other investors who similarly look to select stocks with similar criteria. But a larger question remains. When do you buy a stock? When do you sell a stock? And how do you respond to the market environment in making your decision--in other words--is there any way to avoid bear markets by minimizing equity exposure during these difficult times, and is there similarly any way to maximize equity exposure during bull markets and positive market environments? And can we do this automatically? It is tough enough to select a stock, but managing your portfolio and responding automatically to market action is even a larger demand put upon my own strategy. And to top it off, I am trying to do this publicly. To share my successes and failures with all of you and try to stick to a strategy in a disciplined fashion. And my strategy isn't refined, I am learning that I need to make changes as I implement my own decisions. I still lose money when stocks decline and make money when stocks advance. But if I can develop an approach that adjusts automatically to the market, that guides me to select certain stocks, that lets me know when to be selling those same positions--whether in part or in entirety--I shall achieved something far greater than any particular 'great call'. Thank you for coming along with me in this journey.